The American solar industry is enjoying an era of record-breaking growth. Last year saw more growth in new solar generation—12.5 GW—and jobs—51,000—than any year on record. Thanks to cost declines, more and more homeowners are now opting to purchase the panels outright instead of taking the more common approach and leasing them. The typical payoff period for new solar today is only five to seven years. 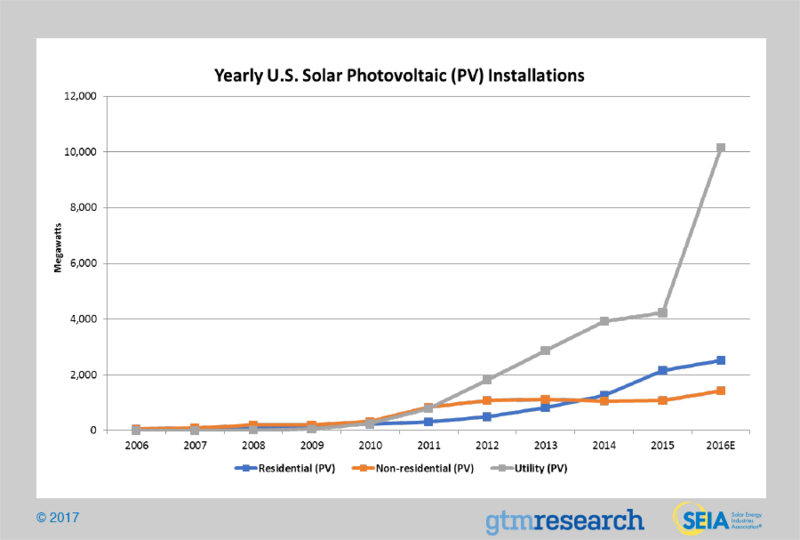 This growth in solar is fueled by many factors in addition to declining costs: technological improvements, greater consumer awareness, increased demand among residential, commercial and utility customers, and a favorable legislative and regulatory environment. This includes the recent extension of the Investment Tax Credit (ITC) at the federal level as well as pro-solar Renewable Portfolio Standards (RPS) and Property Assessed Clean Energy (PACE) financing in a majority of states. Best of all, the industry is showing little sign of slowing down; growth is projected to be even higher in 2017. Despite the great story solar has to tell, the industry faces challenges. Coal and other fossil fuel interests, from corporate shareholders to workers extracting the resources, view renewables as an existential threat to their industry. As a result, large fossil fuel companies and labor groups alike are pushing back. And though some utilities fall somewhere on the spectrum between accepting and embracing solar, the national trade association representing investor-owned utilities (IOUs) is doubling down on coal. Other groups don’t fall neatly into either the supporters’ or opponents’ camp. The Independent System Operators (ISOs), which don’t generate electricity but rather manage its transmission, are wary as they navigate an uncertain future shaped by dramatic growth in distributed generation. To the extent that religion shapes Americans’ views on energy, the Southern Baptist Convention—America’s second largest denomination—has taken a formal position “to reject government-mandated reductions in greenhouse gas emissions.” And even as solar is becoming the new normal, far too many Americans still perceive it more as an upper-middle class alternative for liberal, tree-hugging, latte-drinkers than as part of the mainstream. Solar clearly has an acceptance gap it still needs to close. Fortunately, selling solar is not like selling snake oil—solar truly is a commercially viable and affordable source of reliable, clean energy. These very strengths suggest pathways forward to seek common ground and expand alliances across the political spectrum. Collectively, the top 25 corporate solar users have installed over a gigawatt of capacity nationwide, according to the Solar Energy Industries Association, or SEIA. These commercial leaders are household names such as Target, Wal-Mart, Costco and Kohl’s. However, despite these headliners, the commercial and industrial solar market is lagging. According to joint research by SEIA and GTM Research, since 2014 this market has ranked third behind the utility-scale and residential markets as measured by total megawatts installed. Why is this market relatively undeveloped? I believe a big reason is lack of knowledge. The chief financial concern of most commercial property owners is not climate change or how to manage the energy transition. It’s the bottom line of how they are going to cover their expenses. And even setting aside all the social and environmental benefits of solar, the bottom line is where solar truly shines. Because solar’s cost decline has happened so rapidly, many commercial property owners who could benefit from it are simply unaware how affordable it is. Last month I had a conversation with a commercial property owner and investor who has been in commercial real estate for decades. We were discussing a few of his projects, and when I asked if he had considered installing solar, he said he’d looked into it several years ago, but it hadn’t been worth it. He was knowledgeable enough to cite numbers about the cost per watt installed; the problem was his numbers were out of date. And even though his information was only five or six years old, the intervening years have made all the difference. Solar is now cost-competitive with any other form of power. Last year the Berkeley National Lab reported the price of non-residential solar had declined to between $2.50-$3.50 per watt installed. This represents a 30% to 50% decline over the past six years. As a result, solar has finally achieved widespread financial viability. The big challenge now is simply getting the word out. This is where reaching outside of the solar community to carry the right message to the right audience can have a big impact. Events such as the International Council of Shopping Centers’ annual RECon in Las Vegas—billed as “the world’s largest real estate convention”—and Building Operating Management’s NFMT—billed as “the largest free conference and product expo for facilities professionals”—are two such opportunities to reach real estate professionals who aren’t solar advocates but who would be receptive to the right message. Back to my commercial real estate friend: a week or two after our conversation he called me back and left a message. He had looked into solar some more, agreed that it now appeared viable at least on paper, and was going to contact a commercial installer to pursue it further. One of the knocks against solar is that many of the low and moderate income (LMI) households who would benefit the most from solar are unable to take advantage of it. According to the U.S. Department of Energy, LMI households comprise 40% of the U.S. population but only 5% of all solar customers. A major reason is LMI households are more likely to be renters compared to the rest of the population. As a result, they lack the legal authority to buy or lease rooftop solar, and they are also unable to benefit from any solar property tax credits. Lack of credit history and poor credit are often additional obstacles to accessing financing. Community solar is a way for LMI households and others who cannot connect their own solar to still receive the benefits of solar energy. It achieves this by allowing users to subscribe to a nearby community solar installation, typically in the 2 to 5 MW range. Virtual net metering allows subscribers to pay for the energy they consume and to receive credit for any portion of their energy allotment they conserve. Though still in its relative infancy compared to the other solar markets, a recent report by GTM Research concludes community solar is becoming “increasingly mainstream.” Social entrepreneurs in both urban America—e.g. DC SUN—and rural America—e.g. Solar Holler—are sprouting up and investing their money, time and effort to find suitable sites and to educate and sign up customers. The DOE recently launched Solar In Your Community, a $5 million contest “to support innovative and replicable community-based solar business models and programs that will bring solar to underserved communities.” So far, it appears the initiative will move forward even despite the uncertain future for DOE initiatives in the Trump administration. This broad range of activity around community solar, from government incentives to low-income champions to plain old solar entrepreneurs seeking untapped markets, has led GTM Research to label community solar the “next largest solar growth market” in the U.S.
More than 400 Rabbis spanning the Reform, Conservative and Orthodox branches of Judaism signed a 2015 Rabbinic Letter on the Climate Crisis. The Letter links the “extreme extraction of fossil fuels” to climate change and specifically cites oil drilling, coal burning, and fracking for gas as “overworking the earth.” The Rabbis call for a shift away from “deadly” carbon-burning to a swift deployment of solar, wind and other renewables. Many like-minded religious leaders have been pursuing tangible solutions to address their climate concerns. Some have built bridges across denominations to form groups such as GreenFaith based in New Jersey and Interfaith Power & Light based in San Francisco. The driving force behind these efforts is, as IPL describes it, to bring “the voice of the faith community into the policy-making arena.” Whether encouraging energy conservation by turning off lights in places of worship, or flexing their political muscle by lobbying legislators, organizations like these understand the power of transforming principles of faith into political activity. As mentioned earlier, many labor groups view solar as an existential threat to their industry. It’s not surprising when one considers the staggering job loss in the coal mining sector. It peaked almost a century ago, employing 863,000 Americans in 1923. By 2011 it had dropped to 143,000 and has continued to fall every year since. Last year only 81,000 Americans were employed as coal miners. By contrast, solar employment has been growing like crazy. The 50,000 new solar jobs added last year equate to an annual growth rate of 25 percent. In fact, one in every 50 new jobs created last year was in the solar industry. The problem is this solar job growth has not been geographically balanced, and has failed to reach some of the regions still reeling from the loss of coal jobs. Colorado and West Virginia, for instance, tell a tale of two states. In Colorado, the growing solar industry now employs close to twice as many workers as the coal, gas and oil industries combined. Coloradans have real reason to be optimistic about finding employment in the solar industry. On the other hand, in West Virginia only a relative handful of new solar jobs have materialized. Coal mining, even after all the job losses, still employs almost five times as many West Virginians as solar. It’s no wonder coal country takes such a dim view of solar. They must bear the double indignity of losing their jobs and then seeing all these new solar jobs blossom across the rest of the country instead. It goes without saying there are no easy or quick solutions to the seismic economic shifts rocking coal families. Still, there are some paths forward. Local companies such as Coalfield Development Corporation and Solar Holler work to bring clean energy jobs to Appalachia and to retrain former coal miners to do the work. These groups demonstrate that solar doesn’t need to be the enemy of coal workers; it can be an employment lifeline. And when it comes to jobs and infrastructure, unusual political bedfellows can sometimes find common ground. Just this week, a diverse group of more than 40 energy, labor and utility organizations sent a letter to Congressional leaders to advocate for the expansion and upgrade of the nation’s electrical transmission infrastructure. Although these groups “are seldom in full agreement with regard to energy policy,” they spoke with a unified voice about the need to invest in a resilient, 21st century electric grid. The nation’s electric system is in the midst of a clean energy revolution that is rapidly and fundamentally transforming how electricity is generated, delivered and sold. To the extent this change is producing winners and losers, solar is by any measure a big winner. But despite its dramatic expansion, solar still holds tremendous untapped potential. Markets such as the commercial/industrial sector and low-to-moderate income households remain ripe for significant growth. Strategic partnerships, such as with faith leaders, can be strengthened. And even historically adversarial relationships such as with some labor groups can be repositioned to find common ground. After last year’s unusual presidential campaign and this year’s even more unorthodox start to the Trump administration, few things seem outside the realm of possibility any more. Even liberal, tree-hugging latte-drinkers and far-right libertarians might have more in common than they think. After all, what’s more libertarian than generating one’s own power and untethering oneself from a state-regulated utility monopoly? Stranger bedfellows have there been. Previous Previous post: Come see us at NFMT2017 in Baltimore!